As the two-year Council Period comes to a close, all Tuesdays are precious. The Council only meets on Tuesdays, and with one prior Tuesday taken up by Election Day and one upcoming Tuesday being Christmas Eve, there is a shortage on pre-2019 Tuesdays. This is among the reasons that both the Tuesday preceding Thanksgiving, and the one immediately following the holiday, were cause for brief but essential Legislative Meetings. Any legislation introduced in 2017 or 2018 that hasn’t been approved by the Council by the end of the year will lapse and require starting from scratch in 2019. At the pre-Thanksgiving Legislative Meeting, much attention was focused on a campaign finance reform measure. Serving as a bit of a compendium of reforms suggested by various members both in this Council Period and in prior years, the measure received the first of two needed votes at the most recent Legislative Meeting. At the heart of the measure is a ban on donations from those doing more than $250,000 in contract business with the District. Additionally, the Office of Campaign Finance, currently under Board of Elections jurisdiction, would be transferred to the jurisdiction of an independent Campaign Finance Board. Based on comments from the dais, it appears that the content of this bill could see changes prior to the second vote it must face on December 4. At the post-Thanksgiving Legislative Meeting, the bill that was subject to the most discussion was an omnibus clean energy measure. At the core of that measure is a commitment to move to a 100% renewable energy portfolio by 2032. The bill was passed unanimously, but again, based on comments from the dais, expect to see changes to the bill’s content prior to a second vote on December 18. An additional measure passed at the post-Thanksgiving Legislative Meeting would authorize the mayor to use eminent domain to purchase the site of a trash transfer station on W Street, NE. Also passed at the pre-Thanksgiving Legislative Meeting was a measure that limits wage garnishment on lower income individuals, and that requires notification of all whose wages are to be garnished. Another measure further limited the amount of rent increase that a rent-controlled unit could see each time it becomes vacant from 30 percent to 10 percent in most cases. A final measure passed at the pre-Thanksgiving meeting increased the salaries of the mayor, Council chairman, and attorney general. Since these salaries were originally stated in the Home Rule Act, they can’t be automatically increased via cost-of-living adjustments, and therefore must be increased via standalone legislation. Only a single measure was introduced at the pre-Thanksgiving Legislative Meeting. 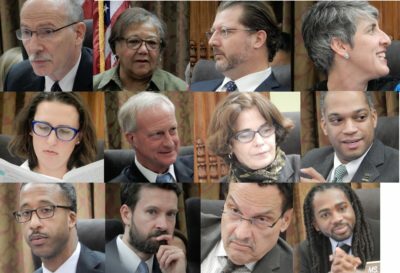 Co-introduced or co-sponsored by virtually the whole Council, it would guarantee all those working in DC up to two hours of paid leave on Election Day. No bills were introduced at the post-Thanksgiving meeting. To view a full list of all votes taken at the two recent meetings, please click here. Barring any changes, the sole remaining Legislative Meetings of 2018 will be held on December 4 and December 18.